Often times, when bad news hits the economic fan, investors will dump stocks and run for the exits. And this is just about the worst thing an investor can do, according to a new report from Fidelity Investments. Weathering volatility, or simply doing nothing is a pretty solid strategy, said the report. And buying when everyone is selling might be even more effective. When expectations are low, any improvement in the global economic outlook can drive strong market gains, said the report. 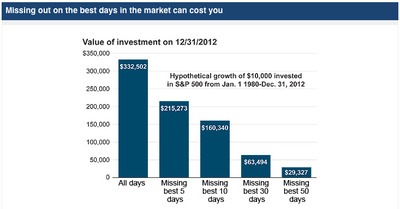 Indeed, some of the strongest days in the market occur during these periods of high volatility. And missing out on just a handful of these days can be devastating to your long-term returns. 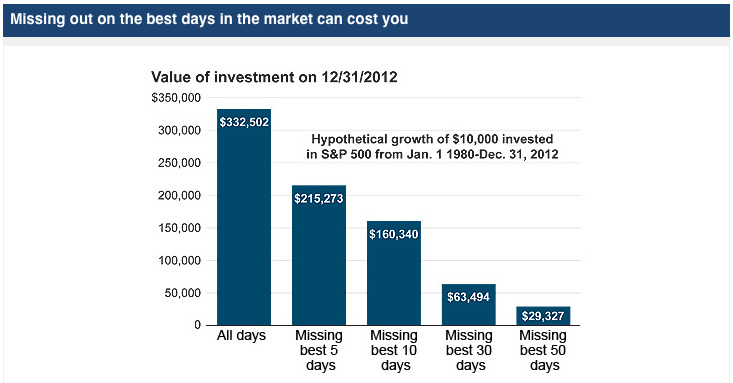 Here’s a chart from Fidelity that shows how much an investor risks losing when they miss just a few good days in the market.